When you’ve got serious jobs, you need a serious projector. When it comes to that? Well, the Sony VPL-FHZ65 Laser Projector is a tremendous option. Built from the ground up to offer exceptional performance on every level, the Sony VPL-FHZ65 isn’t just designed to power a single boardroom or auditorium (though it can do that comfortably), but instead some of the more complex and challenging environments, like in museums, commercial command centres, large houses of worship, train stations and places where typical projectors simply wouldn’t be up to the job. 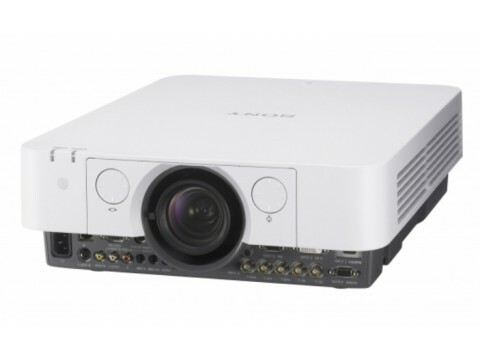 To achieve that, the Sony VPL-FHZ65 has a host of advanced features, including edge blending, multi-projector support, colour matching, constant brightness, 24-hour operation and a 1 second restart – dramatically faster than your average projector – and that’s without mentioning the 20,000-hour life expectancy for its laser light engine. Taken together, these features far exceed the typical specifications of a commercial or educational data projector, but even without them, the VPL-FHZ65 boasts a broad base of solid specifications. Those include a standard 1920 x 1200 resolution for sharp images, a 6000-lumen brightness for use in even well-lit environments and a 10,000:1 contrast ratio which means that in the majority of situations, the Sony VPL-FHZ65 is a superbly visible projector. Additionally, the projector features a standard digital zoom and four optical zoom lengths, which, when coupled with the exceptional levels of lens shift, mean that the projector can comfortably be placed in a variety of environments where most projectors couldn’t be. In regards to inputs, the Sony VPL-FHZ65 is firmly up-to date with the modern standards, with RGB, DVI, HDMI and even HDBateT for running HDMI over long distances (up to 328 feet) over the low cost CAT5e/CAT6 cables, a feature which most commercial projectors have yet to catch up with yet. In terms of living with the VPL-FHZ65, Sony have done an outstanding job in making the projector as unobtrusive and attractive as possible. Aesthetically, it boasts a white or black finish and a tidy, uncomplicated design, which effectively blends into your space, leaving the attention where it’s needed. It even picked up a 2016 Design Award! Additionally, the VPL-FHZ65 boasts front facing inputs so that when viewed from behind (as most people will do), it looks especially neat, something that’s a real boon in environments where aesthetics are key. In terms of day to day management, the Sony VPL-FHZ65 is a pleasant, fuss-free companion in any space. Capable of operating around the clock without overheating issues and with a maximum 34db noise at full power, it’s quiet too. Finally, the new automated filter system largely eliminates the need for regular dust filter cleaning within the projector, and a host of energy-saving efficiencies and features mean that the lifetime running costs of the Sony VPL-FHZ65 are significantly reduced, making it an affordable long-term solution for any space. To find out more about the Sony VPL-FHZ65, head over to our product page, or find the full specification list here.